Dr. Blaine Lehr is a board-certified dermatologist who has been in practice in Oklahoma City since 1995. A native Oklahoman, Dr. Lehr attended the University of Oklahoma as an undergraduate, during medical school, and for his residency training. During medical school he received numerous awards including the Tom Lowery Award for ranking first in the class after the first year and the Mark R. Everett Award for most promise in a second year student. He was initiated into the Alpha Omega Alpha Honor Society as a junior in medical school. In addition to his interests in general and surgical dermatology, he is an expert in male and female pattern balding and has published a book on hair loss and transplantation. Because of his concern for the uninsured poor, Dr. Lehr also runs a Christian-based free dermatology clinic, which he opened in 1998. He is a member of the American Academy of Dermatology, the Oklahoma State Medical Association, and the Christian Medical and Dental Association. He is married and has 3 children. Dr. Zann McMahan is a board certified family physician with a special interest in skin disease. Because of this interest, he has received extensive additional training in dermatology. Originally from Duncan, Oklahoma, he attended Oklahoma Christian University where he played on the tennis team. This was followed by the University of Oklahoma Medical School. He completed his residency in family medicine at Great Plains Family Medicine Residency Program at Integris Baptist Hospital and Deaconess Hospital in Oklahoma City. He is a member of Memorial Road Church of Christ and serves at their free clinic. 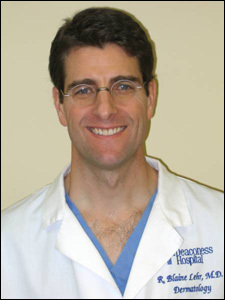 He is a member of the American Academy of Family Practice and the Oklahoma Academy of Family Practice. He is married and has 2 children.